To help my local presence, I decided to whip up some business cards to pass out. I'm not convinced that I'm going to make a lot of sales at the artisan fair (not the best venue, inclement weather, excuses, excuses, etc. ), but I do hope that I get my name out there. 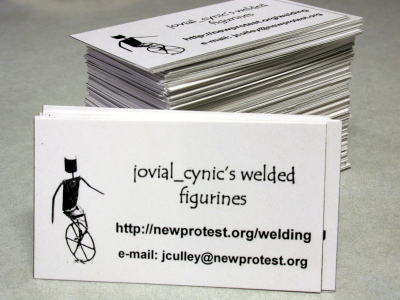 I would love to be known as "that guy that makes those little welded figurines" in my area, so that people who are looking for a good gift idea can know how to look me up. Anyhow, heading out to the artisan fair now to hock my wares. Wish me luck!